I’m continuing to write about mountains in Serbia, but Fruska Gora is somewhat special. Unlike the majority of places that I described so far, Fruska Gora is really close to my home, and I got to know it quite well. Local pride aside, it’s really a great place in many ways, so I decided to make a series of articles about it. First of all, it’s not a mountain. It’s more similar to a really small mountain range, and it’s made up from several elongate, wide hills, extending 80 km lengthwise east to west, and about 15 km north to south. 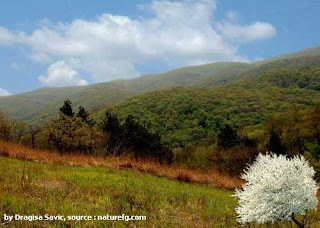 The highest peak is Crveni Cot at only 539 meters, which is not exactly gigantic. 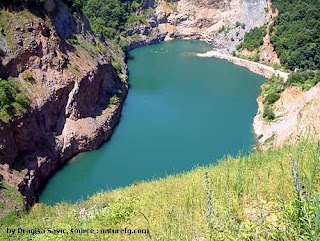 It’s located in the southern part of the northern province of Vojvodina, and it’s the regions only real non-flat part. Second largest city in Serbia, Novi Sad is practically just next to Fruska Gora; some neighborhoods are even almost on it. Belgrade is around 50 kilometers to the south, depending from the point of reference. If I had to describe Fruska Gora in one term, it would have to be: ‘’Green’’. The hillsides are covered with either orchards, grape and wine plantations (Grape dance in fact takes place in Fruska Gora), or with wild forest and meadows. There are several mane-made lakes, and one or two natural ones. The most famous and beautiful is Ledinacko lake that was formed right in the middle of an abandoned quarry (there will be a special article about it, it’s really quite stunning, but has generated a lot of controversy). To people that live near it or on it (there are several small towns and even more villages), Fruska Gora is very important. For some, it’s their livelihoods or home, for other a great, accessible recreational destinations. But trust me, everybody, including me, loves it very much. You’ll find out why exactly in following articles.